﻿﻿For most hunters, there’s more to the passion than just the thrill of the kill. ﻿﻿My “bobbing for apples” started shortly after climbing into the hunting tripod. It was an unseasonably warm November opener, even for Texas, and try as I might I couldn’t keep my eyes open or my head upright. I knew better. I’d been taught better. And, at the ripe old age of 14, I was determined to prove that I was ready to hunt alone and, with a little luck, kill my first buck. ﻿﻿My drowsiness probably had something to do with not getting much sleep the night before, perhaps from the late-night storytelling by the camp elders who regaled one another with tales about deer hunts and camps from years gone by. As I recall, we seemed to have more deer stories than deer at our Gonzales County place. As the youngest member of the deer camp, I didn’t want to miss a single one. I’d heard them all before — stories about big bucks taken from the thick cedar brakes around Llano, the Brush Country down at Laredo and the Big Country over by San Angelo. 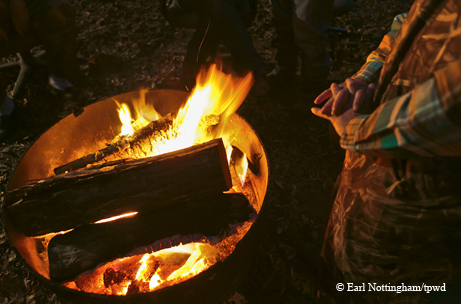 Musings about beloved guns and old jeeps, cold mornings and full moons, camp cooks and campfires, good shots and bad ones, crusty ranchers and colorful game wardens, the wisdom of some game laws and the folly of others always seemed to pepper the conversation. Inevitably, someone would spot lights flickering in the distance, just past Bald Mound, sparking a wave of speculation about whether one of the neighbor boys might be getting an early jump on the season. Some of the younger men would slip off from camp after dinner into Nixon or Westhoff or Yorktown to chase whiskey and song and such. Mr. Tompkins, Mr. Warner and Dad would usually wait up for them, making sure they got back safe and sound. I’d try to stay awake with them, sitting on the porch and listening to the distant coyotes, all the while prodding Mr. Tompkins to tell me one more time what he thought the deer might be doing the next morning. God bless him, he always had an answer for me. Sleep never seemed to be much of a priority at deer camp. Back in that deer blind, I’d awaken every few minutes and quickly scan the horizon to see if a deer might be passing through the post oaks. Nothing, nada, not even a squirrel was moving on that fall afternoon. Sometime late in the day I snapped awake for the last time to see a big spider perched on the tripod railing a few inches from my nose. When I flinched, that spider jumped in my lap, causing me to jump up and bat it out of the stand. No sooner had I sat back down when out of the corner of my eye I saw the prettiest white-tailed buck I’d ever seen staring right at me. Understandably, that buck didn’t care for all that hullabaloo coming from the tripod and immediately made a beeline to a little brushy draw, where it looked as if he’d vanish forever. I knew not to take a shot unless he presented a good, standing broadside one. Alas, my youthful exuberance took over, and I threw that little Ruger .243 rifle up to my shoulder and hurriedly sent a round his way. My excitement quickly turned to anxiety as the buck rolled to the ground with the shot, but just as quickly flipped right up back on his feet and raced off into the draw. I knew better than to try to track that deer alone, so I waited for Dad and Lance to come. Neither had heard my shot, so they didn’t arrive until dark, testing the patience of this young hunter to no end. 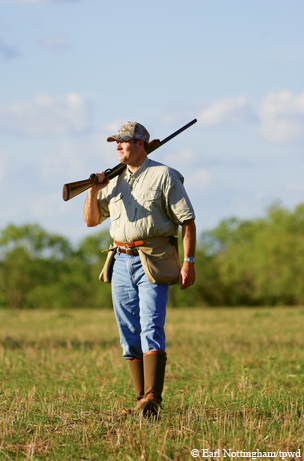 What later ensued that night was recounted many times later at the Gonzales County deer camp. Five grown men and one anxious teenage boy spent the better part of three hours crawling on their hands and knees through a thicket of mesquite and prickly pear trying to find that deer. After encounters with at least one rattlesnake, a couple of copperheads and a nest of coral snakes, someone wisely called off the search for the night, leaving me to spend a sleepless evening tossing and turning until daylight mercifully arrived. That “First Buck” was 27 years ago, and I still remember it as vividly as if it were last year’s opening weekend. Hunting has graced me with a veritable story book full of “firsts,” collected over a lifetime of shotguns and deer rifles, deer camps and dove fields, opening days and first lights, sunflower fields and senderos, quail birds and deer herds. There is one “first” in particular that every hunter will have to reconcile satisfactorily for himself or herself at some point or another. It is the age-old question of why. For veteran hunters, at least in theory, the answer ought to be a relatively straightforward one. But for me, and I suspect for others, it never really is. As much as I love wild game, I can’t argue with a straight face that it is about feeding my family or putting food on the table. Nor can I really truthfully say that I take some real pleasure out of killing, or, to borrow the more biologically convenient euphemism, “harvesting.” I like to shoot as much as the next guy, but it’s not really just about that either. No doubt I love the chase and the anticipation of seeing game that comes with each hour spent afield, but I love those very same hours in those very same places when I have nothing to do but chase the day brought on by a rising sun. So, what then is it about for the million or so of us Texans who dutifully head each year to our cherished hills and bottoms, woods and fields, prairies and pastures to chase our favorite quarry? I remember being asked for the first time why I enjoy hunting. The question shouldn’t have come as a surprise, originating as it did from a college professor of mine who had become increasingly mindful of a string of absences during the fall term. Schoolwork posed an irreconcilable conflict with my time in the dove fields and in the deer woods. So I hemmed and hawed in response to his question, struggling to articulate what should have been a simple answer. Eventually, I mumbled something about wanting to be outside, the thrill of the chase, the rites of fall, family traditions, the camaraderie of camp and so forth. It was truthful but didn’t begin to tell the whole story. By his expression, he knew it, and he knew I did, too. What I didn’t know at the time was that he, too, was a hunter, sympathetic to my predilection and more tolerant than most of his colleagues of my erratic attendance. A few weeks later, he approached me after class and told me he had also grappled with how to explain the desire to hunt. He gave me a book by Rick Bass, The Deer Pasture. “Read this,” he said. “If you’re anything like me, this will tell the story of why we hunt.” He didn’t disappoint. Set within the confines of the family’s deer lease in the granite hills around Willow City, Bass regales his readers with recollections of the land and its wild inhabitants, family and friends, stoic German ranchers, old jeeps, ringtail cats, care packages from his grandmother, cross-country treks to the deer lease, winter storms and camp cooking. Hunting deer was ostensibly why they were there, but the deer pasture, for Bass and all who came there, was about a whole lot more. Whatever our reasons, we enjoy our undeniable privilege of hunting today thanks in no small part to the tenets prescribed by the North American Wildlife Conservation Model. For the uninitiated, the North American model was conceived by prominent sportsmen-conservationists like Teddy Roosevelt and George Bird Grinnell. Roosevelt and Grinnell were hunter’s hunters, men who knew their way around game, big and small, dangerous and otherwise. As sportsmen, they had the good sense to realize that hunting ethics and game laws were sacrosanct, inviolable in principle and action. As conservationists, they embraced the fact that wildlife populations must be zealously stewarded if they were to be conserved for generations to come. And, as leaders, they understood that wildlife, all of it, belongs to the people, all of them. • Fish and wildlife belong to all of us, held in a form of sacred public trust, to benefit generations of North Americans, now and to come. • Fish and wildlife should be managed in such a way that populations will be sustained forever and not exploited. It is a model that works and works well for all who care about wild things and wild places, as well as the people who use and enjoy them. I spent last season’s opening days at the Charco Marrano Ranch, a little piece of God’s country located deep in the Brush Country of La Salle County. It’s a place that literally blooms to life at dawn and dusk with bountiful game. The quality of the habitat and the ranch game reflect the deep sense of stewardship of the ranch owners, Jackie and Phil Hunter, and the management of their dedicated biologist, Jason Shipman. I don’t know if they consciously think about the North American model while they are implementing their many management practices on the ranch. I doubt it, as they are likely much too busy for such esoteric musings, but they are the very exemplars of the model’s purpose and practice. Thanks to Shipman’s expert guiding, I took a dandy of a white-tailed buck, one that I’ll likely never surpass in quality and beauty. But what I cherish most about that hunt was not the taking of a buck, or its size. My pleasure came from simply being part of their deer pasture, a place occupied by four generations of the Hunter family, surrounded by a bevy of close friends, who came together to share in their love of the land and all the wild things that call it home. I hope your deer pastures are filled this season with close family and old friends, warm fires and cold mornings, cherished traditions and new memories. And, oh yeah, plenty of deer.